"Legend has it that this dessert was the result of a major catering disaster. The dessert for this particular event was to be individual chocolate cakes, but someone took them out of the ovens too soon and the centers were not cooked enough and still liquefied. Well, there was no time to take them off the plates and bake them more, so the chef simply had his wait staff introduce the dessert as Chocolate 'Lava' Cake! Brilliant!" Followed the recipe to the dot. 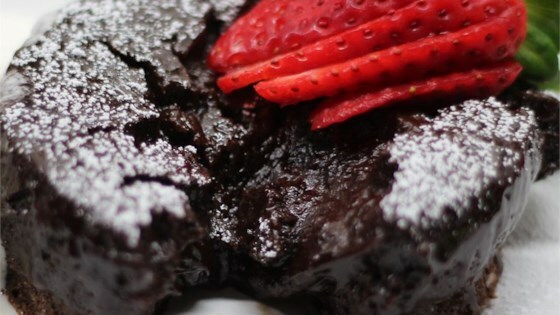 Crunchy exterior until you hit the center---dark molten choco delight!!! This recipe is a keeper. Thanks Chef John. Outstanding! I made it and I've never made anything as exotic before and it turned out incredible! Thanks for the detailed instructions! Followed the recipe exactly and they didn't rise at all. The batter was really thick which is when I got suspicious. Basically made brownies.